A recent report published by Infinium Global Research on antifouling coatings market provides in-depth analysis of segments and sub-segments in the global as well as regional antifouling coatings market. 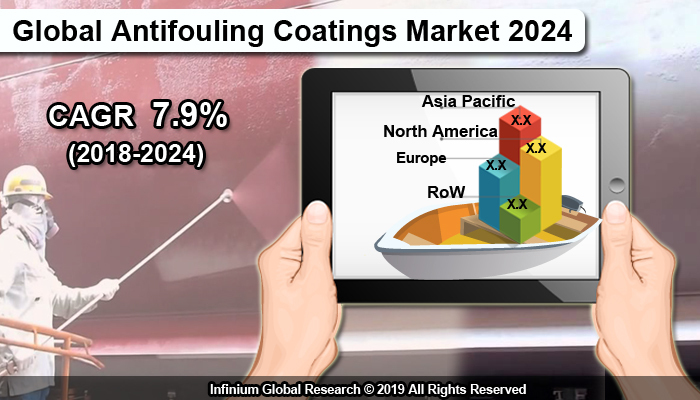 The study also highlights the impact of drivers, restraints, and macro indicators on the global and regional antifouling coatings market over the short term as well as long term. The report is a comprehensive presentation of trends, forecast and dollar values of global antifouling coatings market. According to the report, the global antifouling coatings market is projected to grow at a CAGR of 7.9% over the forecast period of 2018-2024. Hull condition for a merchant ship is a key factor in deciding the fuel efficiency of the ship. The anti-fouling paints decrease the load on the engine and increase fuel efficiency. The demand for the antifouling coatings market is driven by the need for the fuel savings and to prevent the ships from the corrosion. Besides this, the development of low emission coatings is also boosting the demand for the antifouling coatings market. The growing shipbuilding and marine logistics business are further fuelling market growth. In addition, the increase in drilling activities across the oil & gas fields and increasing ownership of leisure boats are contributing to the growth of the market. However, Substitutes such as electrolytic system, ultrasonic and electro-chlorination can hinder the market growth of the antifouling coatings market. Going further, with a growing number of marine and naval vessels coupled with the development of new innovative coatings, the antifouling market is anticipated to grow at the highest CAGR during the forecast period. Among the Geography, Asia Pacific region dominates the antifouling coatings market. The demand for antifouling coatings is strong in this region, as this region has the biggest shipbuilding industry. China has the one largest shipbuilding nation. Maintenance of existing vessels and the emergence of new marine structures are facilitating growth in this region. Moreover, the Asia Pacific region has the highest number of naval ships. Countries like North Korea, China, India, and Indonesia are some of the leading nations having the highest number of naval vessels. Europe and North America follow the Asia Pacific region respectively and is expected to grow at the significant CAGR. The report on global antifouling coatings market covers segments such as type and applications. On the basis of type, the sub-markets include copper based, hybrid, and others. On the basis of applications, the sub-markets include shipping vessels, drilling rigs & production platforms, boats, naval ships, inland waterways, and others (including aquaculture nets and anchors). The report provides profiles of the companies in the market such as Akzonobel N.v., Advance Marine Coatings As, Hempel, BASF SE, Jotun, The Sherwin-williams Company, PPG Industries, Inc., Chugoku Marine Paints, Ltd., Archer Daniels Midland Company, and Nippon Paint Holdings Co., Ltd. The report provides deep insights into the demand forecasts, market trends, and micro and macro indicators. In addition, this report provides insights into the factors that are driving and restraining the growth in this market. Moreover, The IGR-Growth Matrix analysis given in the report brings an insight into the investment areas that existing or new market players can consider. The report provides insights into the market using analytical tools such as Porter's five forces analysis and DRO analysis of antifouling coatings market. Moreover, the study highlights current market trends and provides forecast from 2018-2024. We also have highlighted future trends in the market that will affect the demand during the forecast period. Moreover, the competitive analysis given in each regional market brings an insight into the market share of the leading players.